Her journey on earth was one of dedication, achievement and love, not only for her beloved family but also for her many friends, neighbors and the many students she dedicated herself to teach over many years. Muriel Jean Benner passed away peacefully on Saturday, March 16, 2019 at the Dr. Everett Chalmers Regional Hospital, surrounded by her loving family. Jean was born in Glassville, NB on September 29, 1934, the daughter of the late Frank and Waunita (Brooks) Quinn. A much-loved and respected school teacher for many years, she will be fondly remembered for her distinguished career as a teacher committed to the development of her students. She graduated from Centreville High School and taught for 25 plus years in the Centreville, Bristol and surrounding area schools. Upon the passing of her beloved husband, William "Bill" Benner, and in retirement, Jean moved to Fredericton to be near her family. Jean thoroughly enjoyed her involvement and fellowship at St. Margaret’s Anglican Church, Fredericton, especially the Tuesday morning Coffee Club. She was a member of St. James A.C.W. in Centreville and also a Sunday School Teacher. Her dedication to youth came full circle as one of the founders of Beavers, Cubs and Scouts in the Centreville area. 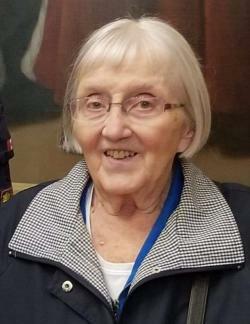 She was an active School Volunteer and a member of the River Valley Swingers Square Dance Club. Left behind to cherish her memory are sons, Kirk Benner and Dwight Benner (Nathalie) both of Fredericton. Jean was a treasured Grammie to Nathan, Braden and Ryan Benner all of Fredericton. Also surviving are a sister-in-law, Mary Wash of Kingston, ON as well as several nieces, nephews and cousins. Aside from her parents and husband Bill, an infant son predeceased her. The family will receive condolences at Bishop’s Funeral Home, 540 Woodstock Road, Fredericton on Wednesday, March 20, 2019 from 2-4 PM and 7-9 PM. A service celebrating Jean’s life will be held at St. Margaret’s Anglican Church, 775 Forest Hill Road, Fredericton on Thursday March 21, 2019 at 2 PM with The Rev’d Rob Langmaid officiating. Interment will be held in St. James Anglican Church Cemetery, Centreville, NB at a later date.